Roderick Wachman is a lifelong horseman, born and raised in Ireland. Kentucky has been his home since 1994. He was the owner of Kingswood Farm LLC in Lexington, Kentucky from 2001-2014. Kingswood Farm specialized in boarding, breeding and raising thoroughbreds. Horses raised include homebreds, G1 placed G City Gal and Self Preservation, as well as client horses like G1 Arlington Million winner HARDEST CORE, amongst many others. 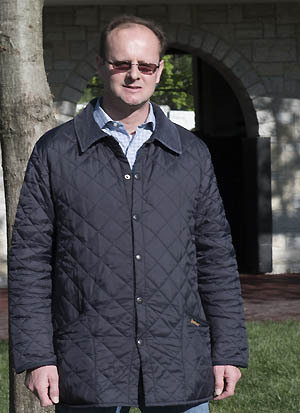 In 2014, Roderick decided to pursue his primary interest, in Bloodstock Services. He started with research and analysis of the International Thoroughbred racing and bloodstock markets. This research helped him become well positioned to take advantage of global investment opportunities in the market. Since then, he’s enjoyed great success in sourcing European racehorses for import to the United States, including 2015 acquisitions Lola Beaux (GB) and Spinamiss (IRE). Also 2014 Australian broodmare purchase, LA FAMELIA (AUS) (AUD 37,500), dam of subsequent G2 Reisling Stakes winner FRENCH FERN (AUS), was a great value client purchase. Roderick Wachman’s extensive international experience and contacts set him apart from many other agents. His early experience began with yearling sale preparations in both the U.S. and U.K. during summer holidays. After college he gained experience at Cheveley Park Stud in Newmarket. He also worked in New Zealand at Waikato Stud followed by a year in Australia split between trainer Bill Mitchell at Randwick in Sydney and Yarraman Park Stud in the Hunter Valley. He arrived in Kentucky in 1994, cutting his teeth at Brookdale Farm and Bluegrass Thoroughbred Services, before starting his own company.